Oskar Groening is a sad and guilty man. How guilty is for the court to decide: he is on trial accused of complicity in the murder of 300,000 people in Auschwitz during the war. The ‘bookkeeper of Auschwitz’ – his responsibilities included counting confiscated money – has not denied being there or the fact that he is morally guilty. Whether he was criminally guilty, he says, is for the court to decide. Groening has talked openly about his past and been vocal in his attempts to combat Holocaust deniers. But he was there: he didn’t like it, but he didn’t resist and he didn’t walk out. What to do with the fast-diminishing number of potential Nazi war criminals is a vast and vexed question. Some say that guilt is guilt, and that there’s no statute of limitations on murder. Others are uneasy about the might of a legal system being brought to bear on a frail and repentant old man so long after the event, when so many others escaped justice or went deliberately unpunished. Eva Kor is one of the few remaining with the unquestionable right to an opinion. Her long Facebook post – and many other utterances during a life spent seeking to heal wounds and bring reconciliation – shows her to be deeply reflective, with a desire to remember truthfully as well as to speak words of grace. But it is the embrace that speaks most powerfully of all. Kor’s words and actions resonate so powerfully because they come from the depths of an experience which has scarred European history forever. But if they were only about the past, they would be of little use. She is much more of a challenge than that. There is, in some people’s minds, something profoundly offensive about her act of forgiveness. Her embrace represents a sort of moral dislocation; as though recognising the common ‘spirit of humanity’ shared by her and Groening is in fact a lack of moral seriousness. In other contexts, between other people, it may be: there is nothing praiseworthy about a failure to judge and name sin for what it is. But that’s not what happened in that embrace. The challenge is to allow that perception of shared humanity to speak into other situations too, which are newer and more raw – and not just the egregious violence of Islamic State or Boko Haram, but the small violences done by human beings to the minds and spirits of one another just because they can. Anger is a terribly potent force. The desire to retaliate, to hurt as we have been hurt, is fatally strong. But a grace-filled will can override the instinct to harm, and create moments of inspirational healing. Christians are not good at understanding forgiveness. It is too often imposed as a duty, with no real comprehension of its psychological cost – and especially when there has been no acknowledgment of sin. 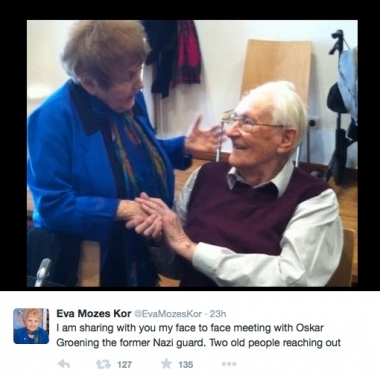 But Eva Kor and Oscar Groening embraced. Sometimes a relationship can be restored and healing can begin.